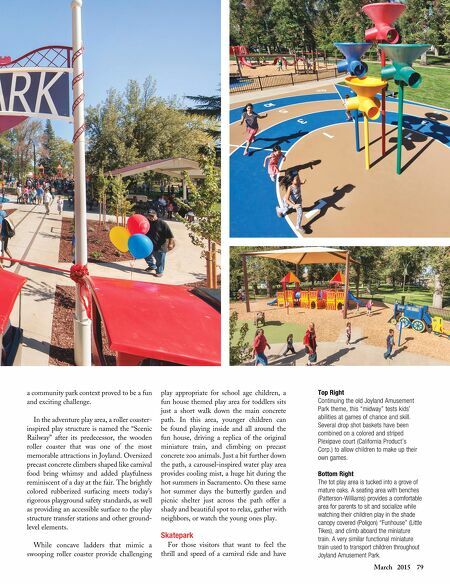 March 2015 79 a community park context proved to be a fun and exciting challenge. In the adventure play area, a roller coaster- inspired play structure is named the "Scenic Railway" after its predecessor, the wooden roller coaster that was one of the most memorable attractions in Joyland. Oversized precast concrete climbers shaped like carnival food bring whimsy and added playfulness reminiscent of a day at the fair. The brightly colored rubberized surfacing meets today's rigorous playground safety standards, as well as providing an accessible surface to the play structure transfer stations and other ground- level elements. While concave ladders that mimic a swooping roller coaster provide challenging play appropriate for school age children, a fun house themed play area for toddlers sits just a short walk down the main concrete path. In this area, younger children can be found playing inside and all around the fun house, driving a replica of the original miniature train, and climbing on precast concrete zoo animals. Just a bit further down the path, a carousel-inspired water play area provides cooling mist, a huge hit during the hot summers in Sacramento. On these same hot summer days the butterfly garden and picnic shelter just across the path offer a shady and beautiful spot to relax, gather with neighbors, or watch the young ones play. Skatepark For those visitors that want to feel the thrill and speed of a carnival ride and have Top Right Continuing the old Joyland Amusement Park theme, this "midway" tests kids' abilities at games of chance and skill. Several drop shot baskets have been combined on a colored and striped Plexipave court (California Product's Corp.) to allow children to make up their own games. Bottom Right The tot play area is tucked into a grove of mature oaks. 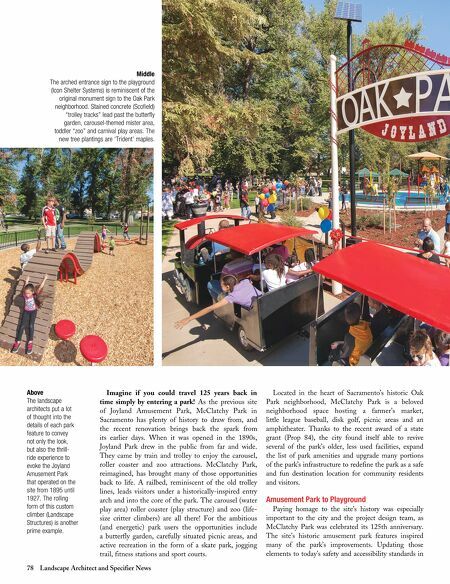 A seating area with benches (Patterson-Williams) provides a comfortable area for parents to sit and socialize while watching their children play in the shade canopy covered (Poligon) "Funhouse" (Little Tikes), and climb aboard the miniature train. A very similar functional miniature train used to transport children throughout Joyland Amusement Park.